Oil and ethanol by ratio 1:6 using 0,5% KOH as catalysator were reacted by utilizing 47 kHz ultrasonic wave for 45, 60 and 75 minutes. Biodiesel conversion value obtained were 49,23%; 70,55% and 52,04% respectively. Biodiesel product spectrum was analyzed using FTIR and GCMS instrument. The density, viscosity and flash point is also measured. FTIR analysis on all variations give similar data spectrum, where the ethyl ester products are characterized by typical bands at specific frequencies such as -C=O; -C-C; -C-H (sp3) and = C-H (sp2) stretch. Based on the data from GCMS spectrum, the product components are ethyl palmitate, ethyl linoleate, ethyl stearate and ethyl oleate. Biodiesel, Esterification, Transesterification ,Ultrasonic, Rice Bran Oil. Haas, Michael J., (2005), Improving the Economics of Biodiesel Production Through the Use of Low-Value lipids as Feedstocks: Vegetable Oil Soapstock” Fuel Process Technol.,86.1087–1096. Mardiah, Widodo, A., Trisningwati, E., & Purijatmiko A. 2006, Pengaruh Asam lemak dan Konsentrasi Katalis Asam Terhadap karakteristik dan Konversi Biodiesel pada Transesterifikasi Minyak Mentah Dedak Padi, Jurnal Kimia, 1(1), 1-10. Özgul, S., Türkay, S. (1993). In Situ Esterification of Rice Bran Oil with Methanol and Ethanol, Journal American Oil and Chemical Society, 70(2), 145-147. Putri, S.K., Supranto & Sudiyo R. (2012) Studi Proses Pembuatan Biodiesel dari Minyak Kelapa (Coconut Oil) dengan Bantuan Gelombang Ultrasonik, Jurnal Rekayasa Proses, 6(1), 20-25. 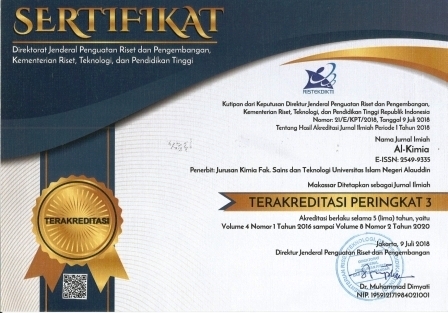 Rahmaniah, Orchidea, 2007, The effect of Substrate Types to FAME Conversion on Acid-Catalyzed Transesterification of Crude Rice Bran Oil” IPTEK, The Journal for Technology and Science, 18(3), 71-77.